Q: Does Beijing view Malaysia-China relations as hitting another historic high after Dr Mahathir's recent visit? A: No doubt the successful visit of PM Tun Dr. Mahathir will usher in a historical new high of China-Malaysia relations. China and Malaysia both have their new government this year. The development of the two countries and the bilateral relations are confronted with new opportunities. In this context, we see the visit of Tun Mahathir as a perfect visit carried out in a perfect timing. Just as what Tun Mahathir said to President Xi Jinping, it was a busy schedule, but every minute of his visit was substantial and delightful. This visit is the first official visit of PM Tun Dr. Mahathir to a country outside of ASEAN after his taking office. It is also the eighth visit to China by Tun Dr. Mahathir as a prime minister. It would be a milestone in the history of China-Malaysia relations, which plays a crucial role of building on the past and preparing for the future. The Chinese side wishes to take this visit as an cherished opportunity to work together with the Malaysian side to push forward our friendly cooperation to develop in a continuous, healthy and steady way on the basis of mutual respect and mutual benefit, bearing more fruits and delivering more benefits to our two peoples. Q: What were the most important achievements for China from Dr Mahathir's 5-day official visit? What has Malaysia achieved in the five days of visit? A:In spite of the short span of the visit and the limited time left for the working level of both side to prepare for it, the both sides are satisfied to see that the desired goals and fruitful outcomes have been achieved during the visit with our close coordination and cooperation. Firstly, the leaders of two countries have set the tune for the future development of China-Malaysia relations by this visit. They affirmed that friendly China-Malaysia relations are in the basic interests of the two peoples. However the situation may evolve, China and Malaysia will always hold friendly policies toward each other. Both sides agreed to enhance political mutual trust and practical cooperation and work for the sustained and steady development of our comprehensive strategic partnership. Secondly, both leaders have pointed out the direction which China-Malaysia relations shall head for. President Xi said during the meeting that, both sides shall push forward the bilateral practical cooperation in the new era and center on the Belt and Road Initiative cooperation. He calls for both sides to enhance the joint planning and the alignment of our respective development strategies, and to promote the industrial and innovative cooperation. We should foster highlights, explore new ideas, new models as well as new areas for bilateral cooperation, and continue to enhance our cooperation, in order to expand mutual benefit and win-win results. Tun Mahathir pointed out that B&R Initiative with an aim to promote the regional exchanges and cooperation will benefit all the regional countries. Malaysia supports and wishes to actively participate in B&R initiative. Malaysia's Look East Policy in the new era shall eye on China and learn from China's successful experiences in development to help fulfilling Malaysia's own greater progress. Thirdly, both leaders have charted out a blueprint for the future development. Both sides agreed to forge new landscapes for China-Malaysia practical cooperation at the new starting point. Both sides committed to treat each other as a partner for trade and investment, industrial cooperation and innovative growth to realize win-win results. The two countries will continue to strengthen and expand cooperation in the fields of infrastructure, industrial capacity, e-commerce and innovation, expand trade volumes, and encourage two-way investment. During the visit, China and Malaysia signed several bilateral cooperation documents including those on finance, palm oil and durian. I believe that there will more Malaysian high-quality specialties such as palm oil and durian entering China's market in the future. The positive willingness of both governments to push forward cooperation in various areas is quite conducive in boosting the confidence of Chinese companies to invest here and creating more opportunities for bilateral cooperation. Fourthly, both leaders affirmed that the two countries will jointly champion multilateralism, oppose trade protectionism and unilateralism, uphold the purposes and principles of the UN Charter and the WTO-centered multilateral trading regime, and promote the sound development of economic globalization. Q:How do you view Tun Dr Mahathir's announcement of cancellation of ECRL and two gas pipeline projects during his visit in China? Is China finding it more challenging and unpredictable to deal with Dr Mahathir on foreign relations? A: Chinese people always consider Malaysia as our friendly neighbor and important cooperative partner. They also consider PM Tun Dr. Mahathir as an honorable senior foreign leader. China and Malaysia enjoy deep traditional friendship and solid foundation of practical cooperation. We have huge potential in cooperation. To achieve win-win situation through cooperation has been the mainstream of China-Malaysia relations. 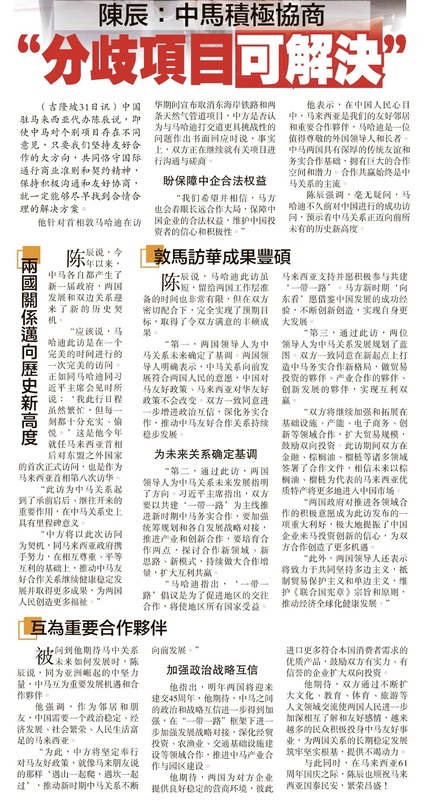 Even if we have different views on particular issue or project, we could finally find a solution which is reasonable and acceptable to both sides, by bearing in mind the larger picture of China-Malaysia friendly cooperation, adhering to positive communication and friendly consultation as well as abiding the international business principles and norms and honoring the Spirit of Contract. Actually, both sides are continuing their communications and consultation on relevant projects. We hope and believe that, proceeding from the overall situation of long-term cooperation, the Malaysian side would also ensure the legitimate rights and interests of the Chinese companies in Malaysia, protecting the confidence and enthusiasm of the Chinese investors. Q:What do you expect Malaysia-China relations to be like, going forward? A:Both being emerging and important countries in Asia, China and Malaysia are cherished opportunities and cooperative partners to each other. As a close neighbor and friend, China wishes to see and need a politically stable, economically prosperous and socially well-being Malaysia. To this end, China would firmly follow the friendly policy towards Malaysia, acting as the Malaysian saying reads Bukit sama didaki, lurah sama dituruni, to promote the progressive development of China-Malaysia relations in the new era. Next year, China and Malaysia will celebrate the 45th anniversary of the establishment of diplomatic relations. I expect that, both sides would further strengthen the political and strategic mutual trust, further synchronize our development strategies under the framework of the Belt and Road Initiative, and enhance our cooperation in areas such as trade and investment, agriculture, fishery infrastructure construction, production capacity and development of industrial parks. I expect that, the two countries will provide a stable and business-friendly environment for each other's enterprises. We can import more advantage products of the other side to meet the needs of domestic consumers, and increase two-way investment by encouraging well-positioned and reputable enterprises to invest in each other country. I expect that, the two sides would further deepen mutual understanding and friendship between the two peoples through the ever expansion of people to people exchanges in areas such as culture, education, sports, tourism and etc, which would result in a larger group of people participating in the cause of China-Malaysia friendship, providing a solid foundation and a strong driving force for the long-term stable development of China-Malaysia relations. On the occasion of the 61th anniversary of Malaysia Independent Day, I wish Malaysia enjoy peace, prosperity and the people enjoy happiness.